Do you find it hard to clean your keyboard or get rid of dust inside? Well this is a solution to your problem as Logitech washable keyboard is easy to clean and easy to dry. 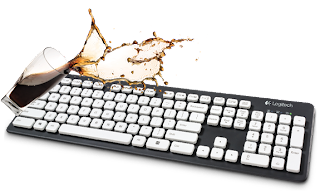 Yes cleaning comes easy from light dusting up to completely soaking the keyboard for a full wash. It’s submergible up to 11 inches of water and has drainage holes at the back for faster drying. This keyboard really loves to be washed. And to ensure that the letter will not fade when you wash it key characters are laser printed and UV coated. Great isn’t it. Sells for USD39.99 at Logitech.